James and Alexander Burns were the fourth and fifth children and only sons of James Kerr and Helen Burns nèe Johnman. Their parents were born in Scotland and emigrated to Queensland with their infant first child in 1884 for health reasons. Having been employed by the Caledonian Railways, James Kerr Burns was quickly engaged by the Queensland Railways. He was rapidly promoted from Clerk to Stationmaster, serving at Albion and Rosewood, ultimately becoming Chief Traffic Inspector based at Roma Street Railway Headquarters. He was also Chairman of the Railway Institute. James Kerr Burns was highly respected and well liked by his staff who referred affectionately to him as ‘JK’. James and Helen Burns had four daughters and two sons - Margaret, Jessie, Helen, James (Jamie), Alexander (Alec) and Annie (Queenie). From 1910, they lived at Indooroopilly in Lambert Road in a large Queenslander style home named Hazeldean. Education was valued so all the children were well educated and encouraged to develop their talents. Before her marriage, Helen Burns had attended the Royal School of Needlework in Edinburgh so she taught her skills to all her daughters. The family was very musical, forming their own quartet. The piano was in the drawing room which was referred to as ‘the music room’. Those who knew the Burns family well described them as ‘a brilliant family’. The Burns family made their contribution to the development of Queensland. The two sons enlisted in the Great War and their stories illustrate the impact of their wartime experiences on their own lives and those of their family at home in Brisbane, Queensland. James (known as Jamie) Burns was born on 21 December 1890 at Rosewood, Queensland where his father was Stationmaster. Jamie worked as a Customs Officer at the Customs House at Circular Quay in Brisbane. He was also in the Army Reserve before World War I. On 19 November 1914, he enlisted in the Australian Imperial Force (AIF) as a Private with regimental service number 455 in the 2nd Light Horse Field Ambulance which embarked on HMAT Borda from Brisbane in December 1914, the first contingent from Queensland to go overseas. He disembarked at Alexandria, Egypt. Jamie became a corporal and joined the Mediterranean Expeditionary Force on Gallipoli Peninsula in May. On 21 September, 1915, he was wounded by shrapnel in the left knee. He was taken from Gallipoli by Hospital Ship Dunluce Castle to Malta where he was admitted to the Tigne Military Hospital. Cables were sent to his parents at Indooroopilly advising that he was ‘reported dangerously ill wounded’. Septic poisoning had set in and he had 17 operations for gangrene. Though off the dangerously ill list by late October, he was transported by SS Regina D’Italia to England for admission to the General Hospital in Oxford on 12 November 1915. He was the first Australian serviceman treated in Oxford Hospital and while there, he met the Princess Royal. In June 1916 at No 1 Auxiliary Hospital at Harefield, England it was necessary to amputate his leg. An artificial limb was fitted. On 22 July 1917 he was discharged from the AIF as permanently unfit for active service at home or abroad. It was unusual for soldiers unfit for active service to be discharged in England. A certificate of discharge was issued on the grounds that James Burns stated he had relatives residing in Scotland, he was able to maintain himself in England and he had no dependents or engagements necessitating his return to Australia. At the same time, the Customs Branch of the High Commissioner’s Office of the Commonwealth of Australia in London declared it was willing and anxious to make use of Corporal Burns’s services as early as possible. Following his discharge James Burns took up duty officially in the High Commissioner’s Office a few days later. By taking his discharge in England, James forfeited a free passage to Australia. In ensuing months he continued correspondence with AIF administration headquarters concerning an unpaid ration allowance of 1/7d (16c) a day while he was on furlough and his distress as a result of his leg amputation. At the end of the year 1917, James Burns, while still employed at Australia House, The Strand, London, received a Certificate No 477 in recognition of his military service along with a Silver War Badge to “be worn on the right breast or on the right lapel of the jacket, but not in Naval or Military uniform”. After returning to Australia, James Burns completed a Bachelor of Commerce degree at the University of Queensland and continued his employment in the Commonweath Public Service, becoming chief clerk of the Queensland branch of the Commonwealth Health Department. In 1919, James married Irene Mona Eames and they lived at Ascot. They had one son, Malcolm Eames Burns (who was born deaf). His wife predeceased him. In 1937, Jamie married Dulcé Letitia Eames, an accomplished musician and composer. Her composition of both words and music of Ring! Peace Bells, Ring! was published during World War II. After retirement from the Public Service, James Burns, B Com, ACIS, AASA was a Registered Public Accountant and Chartered Secretary in Julia Creek, Queensland where he handled the accounts of large station properties and contributed to the public life of the town. Shortly after his arrival, he was appointed Branch Secretary of the Julia Creek branch of the Central and Northern Graziers’ Association. 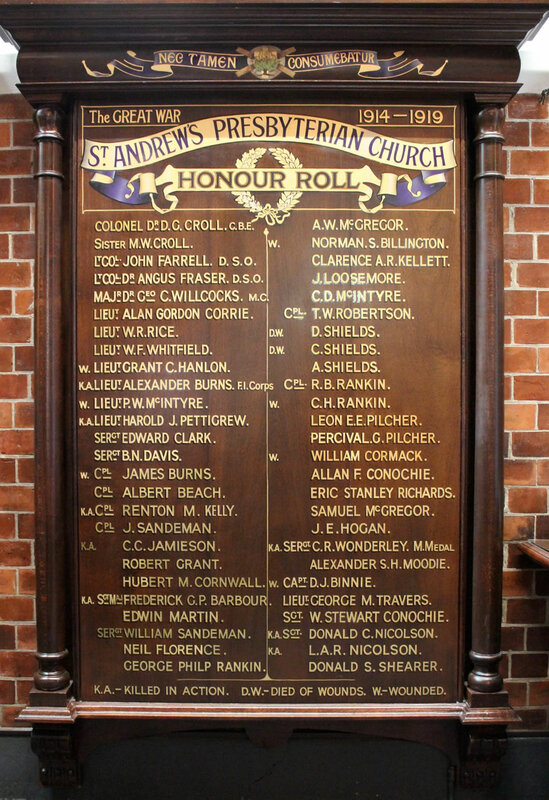 In Brisbane, James Burns’s name is on an Honour Board at Saint Andrew’s Uniting Church and the Department of Trade and Customs WW1 Honour Board at the Customs House. He died at the Kenmore Repatriation Centre on 25 September 1968, aged 78 years. He willed his body to the University of Queensland for medical research. Information and photographs were provided by Janice Fay Anderson (née Boyling), M Ed St., BA, B Ed St, Dip Ed , AMusA., PPL. (Pilot Licence). Janice is the great-niece of James and Alexander Burns, her father being Keith Alexander Boyling, son of Charles and Margaret Boyling (nee Burns). Margaret was the first child of James and Helen Burns and eldest sister of Jamie and Alexander. Janice remembers well her Uncle Jamie with whom she shared her birth date. He inspired her to university studies and the memory of Alexander, the first pilot in the family, inspired her to gain her Pilot’s Licence.